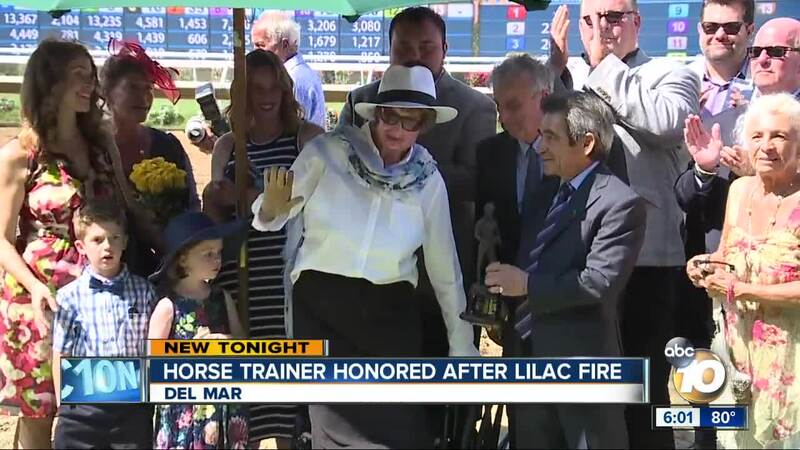 DEL MAR, Calif. (KGTV) — The woman who charged in to danger to save horses from the San Luis Rey Training Center during the Lilac Fire was honored Saturday. It was “Two Hail Marys” that crossed the finish line first. But the real winner at Saturday’s Pacific Classic was Martine Bellocq. In front of a roaring crowd, Bellocq received the prestigious 15th Laffit Pincay Jr. award. 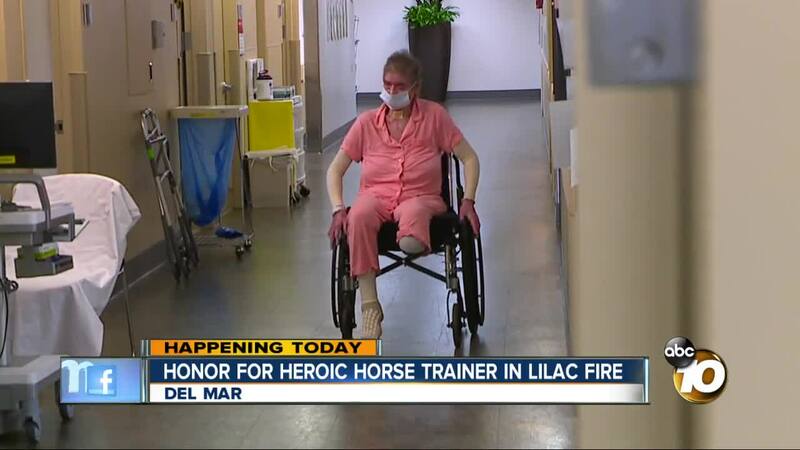 Her recognition stems from her heroics during the Lilac Fire. "The award is that you have to serve the industry with integrity, distinction, dedication, and honor," Mack McBride, with the Del Mar Fairgrounds, said. "And most certainly that lady qualifies for that with what she did." On December 7th, 2017, Bellocq risked her life to save hundreds of thoroughbreds at San Luis Rey Downs. She went into the blazing barns, breathed in the black billowing smoke, and almost didn’t come out. Her husband Pierre found her near the stables, on the brink of death. “It burns, it hurts, and sometimes I feel like, not depressed, but oh, why did this happen to me?” Bellocq asked. More than 450 horses were housed at the training center, including six owned by Bellocq and her husband according to a family member. Three of the Bellocq’s horses died in the fire, as did more than 20 other horses at San Luis Rey. "We might have lost every one of those horses there," McBride said. "If it wasn't for people like Martine, we could have." 10News caught up with Bellocq three months ago in rehab. After months of being in an induced coma, she’d woken up with 60% of her body burned, multiple skin grafts, a tracheotomy, and an amputation on her left leg. Still, Pierre was by her side, every single day. "He’s a wonderful man," Bellocq said, lovingly. She lost three of her horses that fateful day. But she never let go of her resilient spirit. “I’m a strong person. I work with horses. You fell down on your horse, you have to go back on," she said. Bellocq embraced her award, crediting her incredible recovery to her beloved husband, her children, and grandchildren. “They say, 'Mommy! You look wonderful. We don’t care about your eyes, your legs.' They kiss me. They hug me. And they say, 'When they go fix you more and more, you going to look beautiful.' ... Well, inside me, I feel beautiful.” she said.